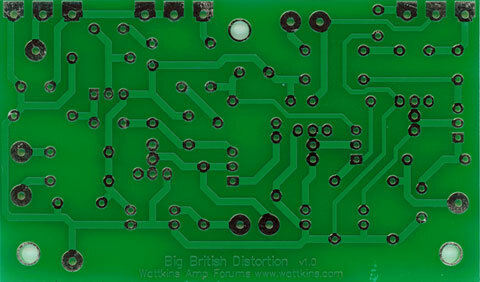 This circuit is a high-gain circuit modeled after the classic British distortion sound. It's not another "clone" pedal. Special thanks to Burchtone for the original schematic (see below), and Katopan for the PCB layout. We have received our first batch of PCBs and these are now shipping. Don't forget to install the link wire next to gain pot VR1! The gain pot will be ineffective without the link wire. OP1 LINK/100K is option 1 included on the PCB (more info below under Component Choices). It needs to have either a link wire or a resistor installed for the bright switch to be effective. Pot orientation on the PCB is made for the pots to be PCB mounted or wired off-board and located above the board with the pot legs at the bottom pointing toward the board. If the pots are mounted with the legs at the top, or if the PCB is installed upsidedown (components same side as pot shafts) then the outer wires to the PCB will need to be swapped over. PCB mounted pots will support the board once installed in an enclosure if soldered as shown on the RFD FAQ page. All JFets are J201. 2N5457 may be used for less maximum gain, but brighter top end. R4, R8 and R12 are trim pots. 50k is recommended, but depending on JFet variation, 25k, 50k or 100k may be used. Approximate setting for the average J201 is ~22k. If the sound is too dark for your amp/speakers, reduce or remove C5 and C8. Further brightness may be added by reducing the value of C11. If reduced top end gain is desired when Bright is engaged, add a resistor between C4 and Bright Switch. 100k is recommended but adjust value to taste. * This is OP1 (option 1) on the PCB. OP1 needs to be either a link wire or the mentioned resistor. As mentioned above the bright switch will be ineffective without either a link wire or resistor here. Ceramic caps are recommended for all pF values, box film caps for all nF values, and aluminum electrolytics for all uF values. An additional gain boost may be added by bypassing R12 with a 10uF cap as done on R4 and R8. Be aware C6 and possibly C9 may need reduced to approximately 1n to reduce mushy response. The gain boost may be made switchable. Add 100k between the gain boost cap and the source of Q3. To switch, simply short the 100k with the switch for more gain. Using this method will produce no pops when switched. * This is OP2A & OP2B (option 2) on the PCB. OP2A is the 100k pop removing resistor. OP2B is the 10uF source resistor bypass cap. If you don't want the gain boost option leave nothing connected to the pads of OP2A|100K, OP2B|10uF & S2|BOOST. Boost engaged all the time install OP2A & OP2B, and a jumper wire for S2. Switchable install OP2A, OP2B and S2. Keep leads short, as there is chance for oscillation. Shielded wire is a good idea, but not required. 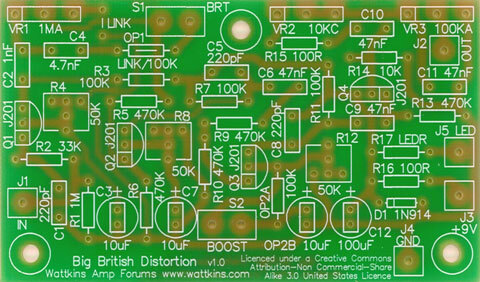 wattkins.com BBD PCB by Wattkins Amp Forums is licensed under a Creative Commons Attribution-Noncommercial-Share Alike 3.0 United States License.